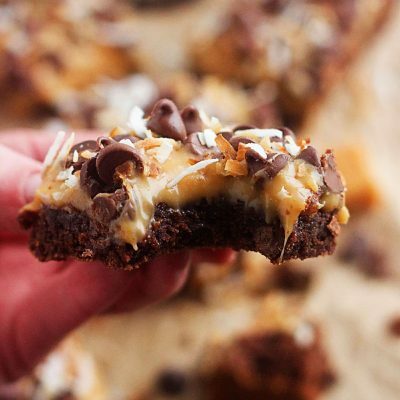 Brownie Caramel Coconut Bars are loaded with chocolate chips, melted caramel, toasted coconut and more chocolate chips! 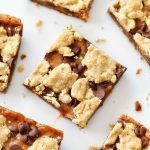 These bars are rich, decadent and absolutely amazing! 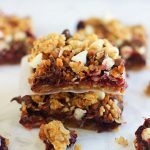 Hey there, it’s Jodi from 5 Boys Baker and today I’m sharing a delicious, decadent brownie recipe that you’re going to love. After many years of baking, I’ve come to the conclusion that you can never have too many chocolate chip cookie or brownie recipes. You just can’t. 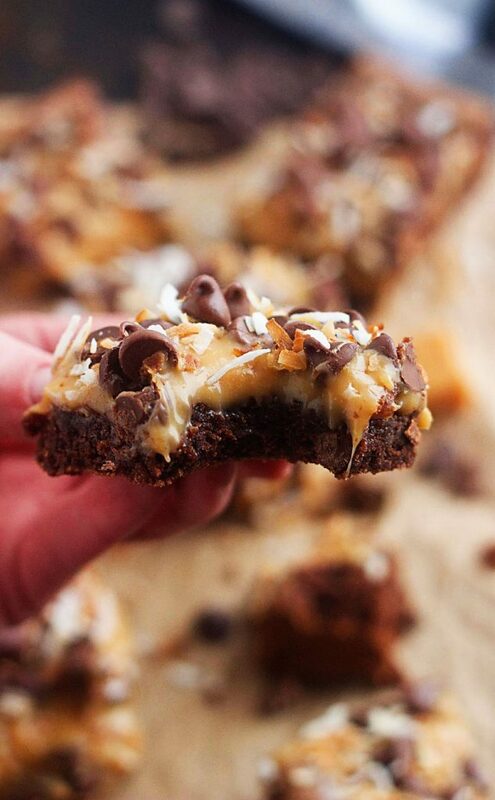 These Brownie Caramel Coconut Bars have the best of so many worlds. . . chocolate, caramel and coconut. I love them all. The first time I tasted these brownies was probably over 10 years ago. My aunt made and brought them to a family party and I fell in love with them. 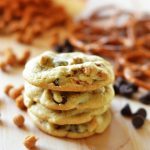 I’m not usually a fan of nuts in cookies and brownies, but the combination of the caramel, chocolate chips, and nuts was pretty dang good. I’m always playing around with recipes and decided to give toasted coconut a try in place of the nuts. Best decision ever. I love coconut, and toasting it adds depth, brings out a nutty flavor and also gives it a crispier texture, which I love. If you’re not a fan of coconut, go ahead use some chopped pecans or almonds if you’d like. These brownies will be amazing anyway. I love these cold, but they’re also equally delicious at room temperature. 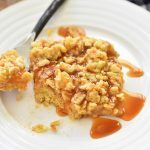 Make sure you store them in a cool, dry place though, because once you cut into them, the caramel tends to ooze down the sides. Heat oven to 350°F. Line a 9-inch square baking pan with foil and spray with cooking spray. Combine sugar, butter and water in medium saucepan and cook over low heat, stirring constantly, until mixture boils. Remove from heat and immediately add the 1 cup semi-sweet chocolate chips, stirring until melted. Beat in eggs and vanilla until well blended. Add flour, baking soda and salt, mix well. Stir in the ½ cup semi-sweet chocolate chips. Spread batter into prepared pan. Bake 17 to 20 minutes or until toothpick inserted comes out clean. 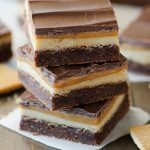 While the brownies are baking, prepare the caramel layer by combining caramels, butter and half-n-half in a microwave safe bowl. Microwave for 1 minute then stir. Microwave an additional 1 to 2 minutes, stirring every 30 seconds, or until caramels are melted and mixture is smooth when stirred. Immediately pour caramel topping over the brownies and carefully spread out evenly. 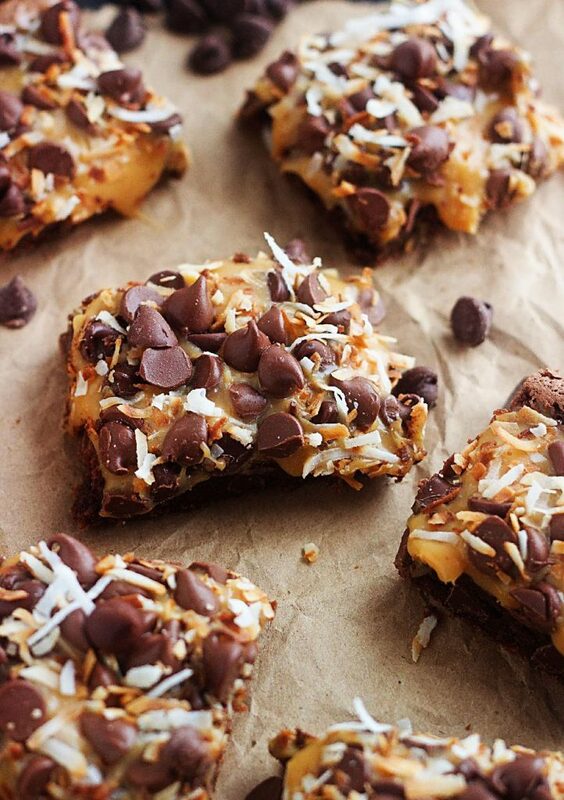 Sprinkle the top evenly with toasted coconut and chocolate chips. 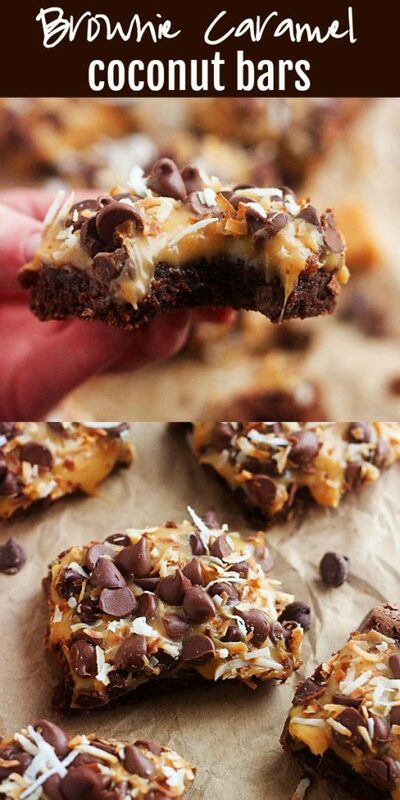 Let brownies cool then cut and enjoy!